A big brother to the 16 ounce Roadster Mug, this 21 oz Sportster Mug is perfect for keeping coffee warm on a long commute to work or cold ice water on a long road trip. 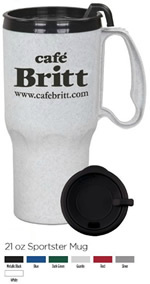 It features double wall construction with a durable handle and spill resistant slide and lock lid. Convenience stores and coffee shops frequently use the Sportster to promote customer loyalty, providing discounts on refills. 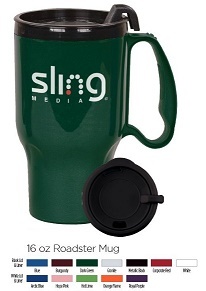 This mug works well for car dealership advertising, to auto repair shops, even to school bookstores.